Quality – The materials and stitching are of high quality and can securely hold heavy items. The neoprene material helps maintain cold/hot, depending on the contents. The handle on the bag itself is well-constructed, and I was able to maintain a comfortable grip carrying approximately 5 pounds. Size – The bag itself is very large. I was able to fit 3 Mason jars and 3 cans of soda with plenty of room for snacks, cups, napkins, bottle opener, etc. I carried Mason jars with neoprene koozies (optimal), but the jars stayed securely in place without any covers or inserts. Featured below are Mason jars with The Original reCAP Mason Jars lids. Together, you can create a personalized, ready-to-go themed gift – let your imagination run wild. 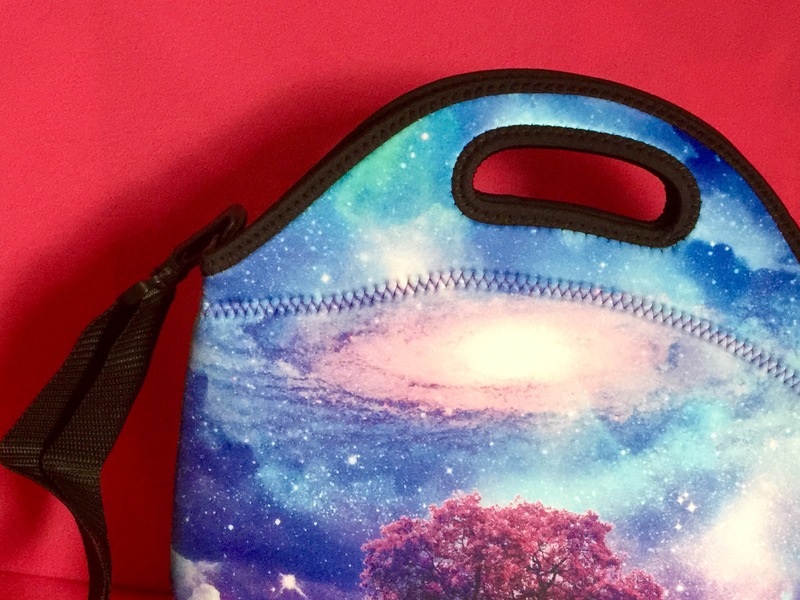 Versatility – This bag would be ideal for an on-the-go lunch; it’s just the right size, big enough to fit a lot, small enough that it isn’t too bulky. I would also recommend as a multi-functional bag for travel and picnics. Graphic Design – Beauty is indeed in the eye of the beholder, and that being said, I am not a fan of the design. Although pretty and colorful, the aesthetic of the bag is not for everyone. I would have preferred it in all black, charcoal grey, navy blue or brown. As an avid enthusiast of astronomy and the Universe, I actually do like the tree with Milky Way background, but the colors are too bright and do not match my style. I like your review, and I actually do like the aesthetics. The milky way. Loves it totes.